2009, Dec. 28, Jyllands-Posten: Tvind’s African activities have received large donations (appr. $100 Mill. from the US Department of Agriculture but exhibit classic Tvind traits like lack of accountability and transparency. Judith A. Phillips of USDA promises an investigation. 2009, Dec. 27, Jyllands-Posten: Reacting on a tip from Mexican authorities Marlene Gunst was detained (not arrested as some put it) in transit from Mexico in Heathrow Airport, London, long enough for a fax to arrive from the Danish prosecutor serving her with a summons. Now if she does not appear for the appeal trial an international warrant for her arrest can be issued. (see April 10th and 18th 2007) my comment: The fact that it took a tip from Mexico to apprehend her shows very clearly that there is no warrant for her arrest presently. If there was she wouldn’t be able to take international flights at all. 2009, Nov. 20, several media: The Danish Tvind schools have lost a trial that goes back to 1999 when the High Court (Højesteret) overruled a law passed in 1996 that intended to prevent the schools from getting state subsidies. In spite of this overruling the government has refused to give the schools any grants for ten years now. The schools took legal actions against the government, a case they have now lost. 2009, Nov. 16, Tvindalert. Late october Hans la Cour died at the age of 55. Hans la Cour was the author of one of the best accounts of Tvind, "The Traveller" (Den rejsende). 2009, Nov. 16, KiroTV. Millions In Clothing Donations Diverted From Charity. 2009, October 30, New Richmond News. Red boxes, red flag? 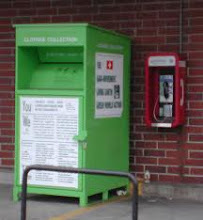 Donation boxes placed by for-profit business. 2009, July 12, Politiken, A report from Tvind activities in Luanda, Angola, and on the general expansion i Africa. My view: They could have credited Tvindalert for actually running the story one week earlier, see July 5. 2009, July 5, Tvindalert, Tvind is now gaining ground in Congo and the francophone Africa. 2009, May 15, Folketidende, Tvind is collecting used clothes in the town of Nykøbing Falster from a lorry. My comment: other organisations have experienced organised theft from their used clothes containers which is probably why Tvind has switched to collecting directly from individual households. 2009, May 7, Dagbladet Holstebro Struer, The Tvind Fund Fælleseje has to pay back a loan of 22 mill DKr prematurely to the now bankrupt Icelandic Kaupthing Bank. 2009, April 14, DR (Midt & Vest) Local authorities in Jutland still use Tvind for troubled youths. The social services of four municipalities spend more than 1 mill Euro annually on Tvind facilities. 2009, March 19, Berliner Zeitung, Volunteers in Berlin's Tvind second hand shops feel exploited. 2009, March 18, Danmarks Radio Only 12 % of the turnover of the British branch of Planet Aid goes to charity. 2009, Feb. 11,(Tvindalert) BBC TV airs a critical investigation of Planet Aid in Birmingham. 2009, Feb. 5. Critical reports about the dealings of Humana in Germany continue. 2009. Feb. 2 (Pressespiegel IFD) The German Bundesministerium für wirtschaftliche Zusammenarbeit (Federal Ministry for Economic Cooperation and Development) has accepted Humana – People to People as a partner in their volunteer program. This has caused concern among the opposition (Bündnis 90/Die Grünen). 2009, Jan. 20. Poul Jørgensen has been convicted to 2½ years of unsuspended jail. 2009, Jan. 9. Today is Amdi Petersen’s 70th birthday. Tadaa. Still no sign of him in public. A verdict in the continuing court case against Poul Jørgensen is expected later this month.